Which Mower is Best for You and Your Lawn? Easy and lightweight can describe your favorite dessert, your last date or the newest lawn mowers. Before you go out and become mesmerized with the selection of new mowers lining the showroom floor, decide what you need, what you want and what's available. Getting a handle on the mower lingo helps, too. If you have a really large lawn with few trees, then a riding lawn mower is the easy choice, but for most suburban lawns, the gas-powered, walk-behind mowers are the natural choice. The average walk-behind mower has a 5 - 7 horsepower motor. Inexpensive push mowers will last five to seven years. They have a built-in obsolescence factor similar to autos. Most cars will last many more years than we give them with a little care and regular maintenance. "The industry says people own a mower for seven years, then they want a mower with newer features," says Gregg Michaels a local Home Depot manager. Consider the size of your lawn, how many trees it has and how heavy the mower is before whipping out the plastic. There's also a decision to be made between gas, electric and reel mowers. With gas over $2 a gallon for the foreseeable future and noise pollution a consideration, an electric mower might be a better option. Electric mowers are easier to start and may be appropriate for small yards. Electric mowers come in a couple flavors. Plug-in electric mowers sometimes come with a 100' cord, while other models are battery-powered. Make sure the battery is rechargeable and will hold a charge long enough to finish the job. Reel mowers don't pollute, are quiet and provide some good ol' aerobic exercise (no need to go to the gym during the warmer months) but they may not be a suitable option. "You're only cutting off an 1/8" - 1/4", which means you have to mow more often," Michaels says. In the spring lawns grow that much in one day. Get a period of steady rain for several days and your lawn will be way too tall to cut. Forget about going on vacation unless you have a neighborhood kid cut the lawn for you with his little gas powered beast. Easy-start mowers are crucial to many homeowners. Pull starts require muscle and can be finicky, especially if you don't do that regular maintenance. Electric starts are good for those with limited arm strength, and those people that just like to have the best. Maneuverability is also an important consideration for yards with lots of trees or intricate landscaping. A self-propelled mower requires less pushing and would be good for hilly or large lawns. Today's self powered mowers go when you go and stop when you stop, no more wrangling with a clutch when you have to slow down or speed up. 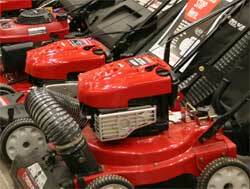 A lawn mower buyer also must decide between a machine with a bag to collect the clippings or a mulching mower. A mulching mower is eco-friendly and does a better job at mulching than one that can do both. But not enough difference to make that much difference as far as how good a mulching job it does. Most mowers will give you the option of doing either. Side baggers or rear baggers are also another option. The rear bagger is easier to maneuver and more stable. For the mulching operation to work properly you have to be aware that you can't lop off a lot of grass at one time (and you shouldn't be removing more than 1/3 at any one mowing). If you cut off more than the mower can handle you'll get large clumps of chewed up grass that looks bad and can cause your lawn to yellow where the clumps lay. Rear-wheel or front-wheel drive models are a personal preference. Rear wheel drives on self-propelled mowers give better traction for hills and large areas. Front wheel drive offers easier maneuvering in small yards. Choose a mower with a heavy gauge deck that's easy to raise and lower the mowing height. That's an important feature because a good lawn requires different mowing heights depending on the time of year and how tall your grass has grown since the last mowing. Also pay attention to the wheels. Ball bearing wheels are a better choice because they last longer, but they also cost more. Three-in-one mowers provide a range of options: Bag, mulch and side discharge. "They're more expensive than other mowers, but they're also self-propelled," Michaels says. However, it may be more mower than the average homeowner needs. Consider what the mower actually will be used for, and buy accordingly. Most homeowners may only use one of the 3 options with any regularity. If you're looking for the newest models and widest range of selection, shop in early spring when there's still a good selection. Fall can offer a few deals, but the selection will be down to just a few models and price ranges. Avoid buying off-brand models so there won't be any problem with service. Consider whether the mower can be serviced locally or needs to be sent out for repairs. Ask yourself if you would rather spend the money on a lawn service and have your Saturday's free to do something else, or would you rather have a new mower. The cost is about the same-- it's all just a matter of how much time you want to spend. Check the boxes that best describe your opinion. How important do you consider your contribution to the health of our environment? Extremely important— maybe I recycle newspapers, soda cans, am a possible member of the Sierra Club, and sometimes I even ride a bicycle to work. Somewhat important. I think we should conserve our resources where we can. The environment is important, but I don't think that how I cut my grass will make any difference in the overall quality of our environment. How much time do you have to spend cutting the grass each week? Time is not a problem. I have no life other than caring for my lawn and landscape. I can fit in a few hours devoted to cutting the grass after work. Time for grass? Are you kidding? With work, golf, vacations, and bingo, I don't have time to even spend time with my own kids much less cutting grass. How complex is your landscape? Landscape? I don't have a landscape. Landscapes are for rich people with lots of gardeners taking care of things like mowing. My landscape consists of just my lawn unless you count that maple tree I've got growing in the front yard. We've got the average amount of landscaping with a few beds and trees. Nothing real complex though. I mean, I don't have to mow around a lot of things. My landscape was designed by crazy people that didn't have a clue. Mowing my lawn is like trying to mow through a maze with trees and my other half's flower beds are everywhere. What kind of lawn mower attachments do you think you'd like to have on your mower when you buy a new one? I didn't know lawn mowers even had attachments. What kind of attachments are we talking about? Do these attachments require some sort of tools to attach? I guess a mower bag would be a good attachment to have so I could catch grass clippings every now and then when the grass gets too tall. My lawn mower is just one of my many status symbols. If my lawn mower isn't self-propelled, self starting, has 3 different speeds, and almost runs by itself... well, it just wouldn't be a real-man's lawn mower, now would it? How important is exercise to you when you're mowing your lawn? Lawn mowing is just one of my forms of exercise. I like to walk, jog and play tennis regularly. Exercise is ok, but it's not what I call a real necessity, at least not as far as mowing the grass is concerned. I really don't think I want to get that much exercise from mowing my lawn. In fact, the less time I spend mowing the grass, the better off I am. A reel or electric lawn mower may be just what you need. 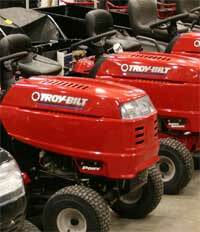 These mowers are relatively easy to maintain, are environmentally friendly and quiet. Reel mower do require you do be physically fit and have plenty of time to devote to mowing. In this range, you'll be happy with either a self-propelled or push mower. You might want to consider one that has a mulching blade that chops up the lawn clippings and deposits them back to the soil providing additional fertilizer without having to go through the process of bagging and emptying. If you have a lawn that's bigger than a putting green, then a riding lawn tractor mower might fit you just perfectly. Lawn tractors or their big brothers, garden tractors, are available with the most options that just depend on your budget and needs. You can turn lawn mowing into a real art form with a riding lawn tractor. These are just suggestions but by answering the questions honestly, it can give you an idea of what type of lawn mower might best fit your expectations and your landscape.